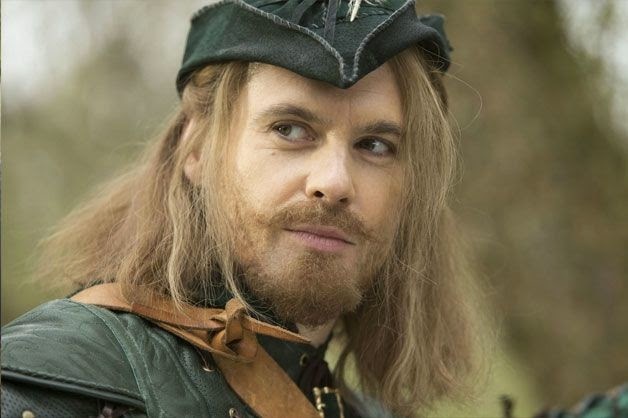 DOCTOR WHO: Robot of Sherwood - This One Hit The Target! | Warped Factor - Words in the Key of Geek. DOCTOR WHO: Robot of Sherwood - This One Hit The Target! After being disappointed with the first two episodes of Peter Capaldi's debut season I had decided to give series eight one more night of watching live on BBA. I'm very pleased I did. I was seriously delighted with Robot Of Sherwood - a gifted lovely romp pitting actors of equal talent against, and then with, each other. As the TARDIS left at the end of the episode, I was relieved. Yep, relieved. For me, Capaldi showed excellent full-out Doctor moments in this incredibly subtle and perfectly timed comic performance. He was chagrined, arrogant, petulant and still blustering. Wow. Truly, the deft mastery of writer Mark Gatiss showed, providing and entertaining story whilst also rescuing the season. I loved the ending where Robin and the Doctor fully transitioned the audience from 11 to 12 by using the motif of life being a story. I could hear Matt Smith saying, "we are all stories in the end," and was delighted by Gatiss out Moffating Moffat. This episode was what I expected from the beginning of season eight. I think Doctor Who is at its best balancing humorous adventure with a liberally deliberate dash of pathos, and I just hope other newbie Whovians stuck it out to see this, too. Clearly, we got what everyone has been telling us we would eventually find. There WAS a new Doctor on board the TARDIS... and yet I saw Tennant and Smith...even Eccelston in this regenerated number 12. (To be honest, it was probably Eccelston's demeanor I saw the most.) Having seen the previous regenerations and premiere episodes... I saw a new man from both 10 and 11's start. Without that in Mr Capaldi's first two episodes, I can admit I panicked a bit. But in Robot of Sherwood, however, it felt like the Doctor awoke. What I did not expect, or even anticipate, was the truly effervescently giddy Tom Riley. The preview looked kinda cheesy - hokey as we say in Indiana, but I was determined to give 11's plea to stay with the Doctor my best effort. As promised, there was no flirting, no posturing, nothing but plot and solid authentic characterization present in a beautifully filmed and quality episode. It felt, looked and sounded fresh. Riley was a large part of that and seemed to bring out Gatiss' words and reignite Capaldi's youthful Who obsession. Even my favorite companion, Clara Oswald, seemed appreciated in this episode. She picked the locale, and once there, she was cheeky and became the "leader" of the trio. This episode could have come right after any with Smith because she knew this doctor and therefore so did we. It was fun to have our Doctor back. So, Saturday night they had me with a spoon. A flawed, opinionated and still quite a crusty Doctor. Peter Capaldi's talent shone throughout the episode, yet never more than in the scenes with Tom Riley. Steven Moffat needs to give this guest star and writer their due. 8.3 was a delightful, unexpectedly delightful, surprise. Whew, Doctor Who is back. Stacy enjoys sharing her occasionally polarizing opinions to elicit discussion. In a phrase, she states: "I don't want readers to be parrots...unless they are of the Python variety wherein a "palindrome of BOLTON would be NOTLOB." A former university professor and current secondary educator... Ms. Embry is also a writer, Educational Psychologist and Grief Counselor in Indianapolis, Indiana USA.